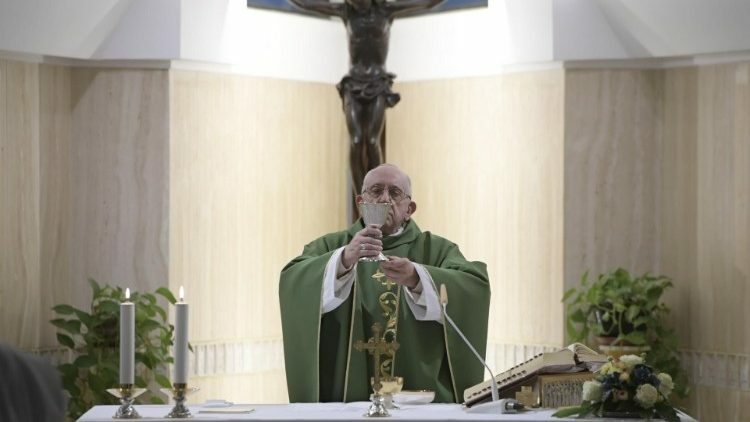 In his homily at Mass in the Casa Santa Marta on Thursday, Pope Francis reflects on the end of the world and says the Christian life cannot be reconciled with a worldly mentality. Pope Francis turned his thoughts at Mass on Thursday to the end of the world. He took his cue from the readings of the day from the Book of Revelations, which describes the destruction of Babylon, a symbol of worldliness, and from the Gospel of Luke (21:20-28), in which Jesus tells of the devastation of Jerusalem, the holy city. Pope Francis said that corruption will be revealed under her magnificent beauty and that her feasts will be exposed as false happiness. Pope Francis then turned to the fate of Jerusalem. She will see her ruin, he said, in another type of corruption, “the corruption that comes from unfaithfulness to love; she was not able to recognize the love of God in His Son.” The holy city will be “trampled underfoot by pagans” and punished by the Lord, the Pope said, because she opened the doors of her heart to pagans. Returning to the two readings, Pope Francis said that, after the condemnation of the two cities, the voice of the Lord will be heard: Salvation follows destruction. “And the Angel said: ‘Come: Blessed are those who have been called to the wedding feast of the Lamb.’ The great feast; the true feast,” he said. Finally, Pope Francis invited us to think about the Babylonians of our time and about the many powerful empires of the last century which have fallen.